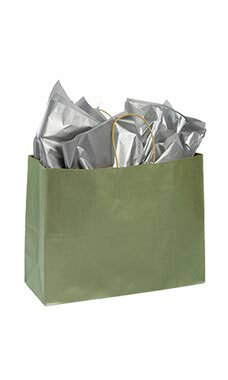 The Large Metallic Sage Kraft Paper Shopping Bags are perfect for any retail store. It's easy to offer your customers a convenient way to carry purchases. Just add tissue paper, and these stylish bags become gift bags! Featuring a gusset and handles, these paper shopping bags are easy to fold up and store away, and convenient to pull out when needed. More tear resistant than traditional paper bags, the Kraft shopping bags will hold more items and heavier purchases. All of our wholesale Metallic Sage Kraft Paper Shopping Bags are Sold in cases of 100. We also offer custom paper bags where you can add your logo, messaging and more. Check out all of our Custom Creations to build a comprehensive look that will make your store stand out from the competition!